Earlier this year, I decided to spend a morning wandering the Vic Market – enjoying the bustle of weekend shoppers buying their fresh fruit and veggies, their fresh fish and meats and their half tonne of deli dips, cheeses and boureks (I’m sure you’ve done it too!). After having my breakfast of Market Lane Coffee and a sour plum jam donut, I decided to wend my way through the other market stalls – those with the weird trinkets and toys, the organic soaps and bathsalts, the polyurethane blankets with pictures of tigers or the Macedonian flag on them. I must admit that on my stroll, I didn’t expect to find anything as wonderful as a small stall offering incredibly beautiful shoes all the way from Venezuela! 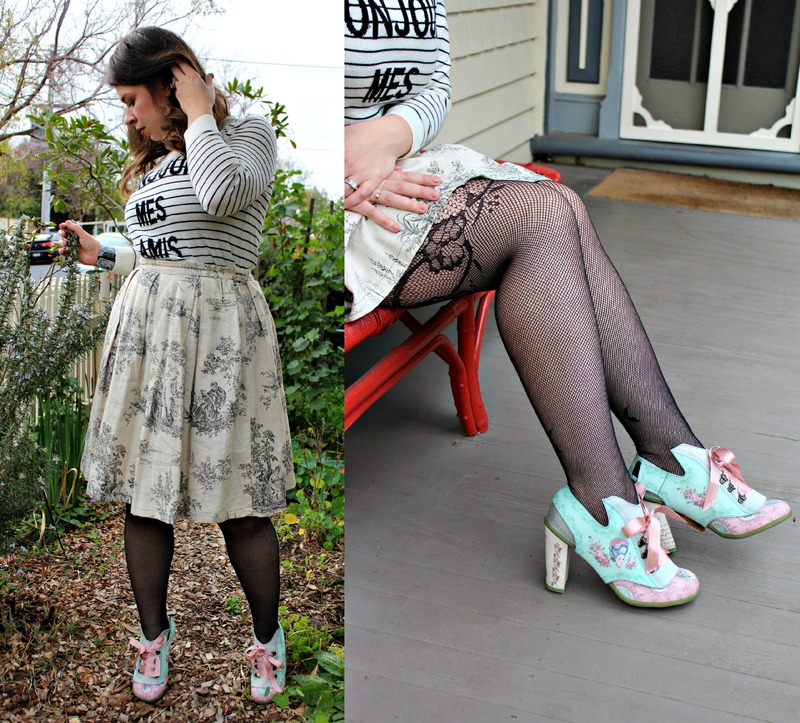 In today’s Ruby Assembly blog, I share with you what might be my best fashion discovery ever – Hot Chocolate Design shoes. A brand famous in its home nation for unorthodox designs and bold use of color, Caracas-based Hot Chocolate Design are now sharing their quirky flat shoes, decorative heels and accessories with Australia. 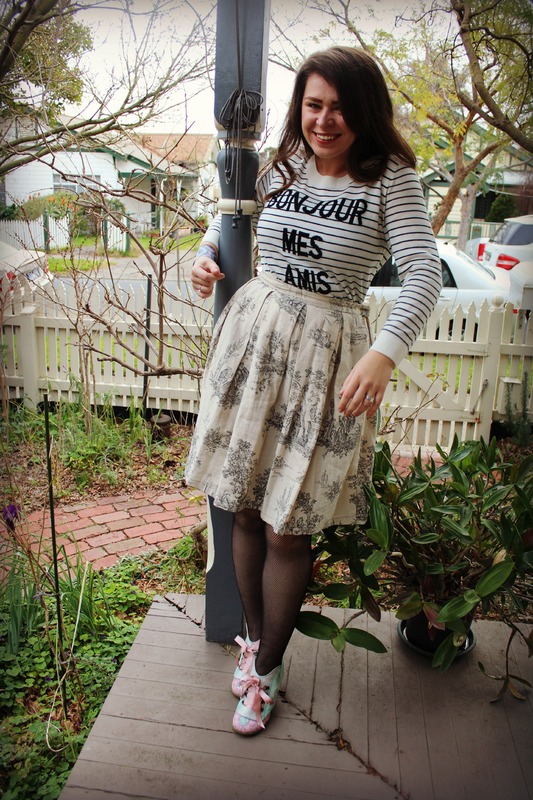 The shoes I’m wearing above are from their Chocolaticas range – they’re called Poesia Cortesana (courtly poetry), and when I laid eyes upon them I knew I was onto something special. I’ve never seen shoes which are so painterly beautiful, ultra colorful and perfectly me. Created by a brother-and-sister team of graphic designers – the Aguerrevere family from Caracas, Venezuela – the Hot Chocolate Design range of shoes are just the thing for market-wandering, or spending an afternoon wandering through the gallery. Their packaging is also amusing and playful – coming as they do in a giant chocolate-milk shaped shoebox oerspex slices of ‘cake’. 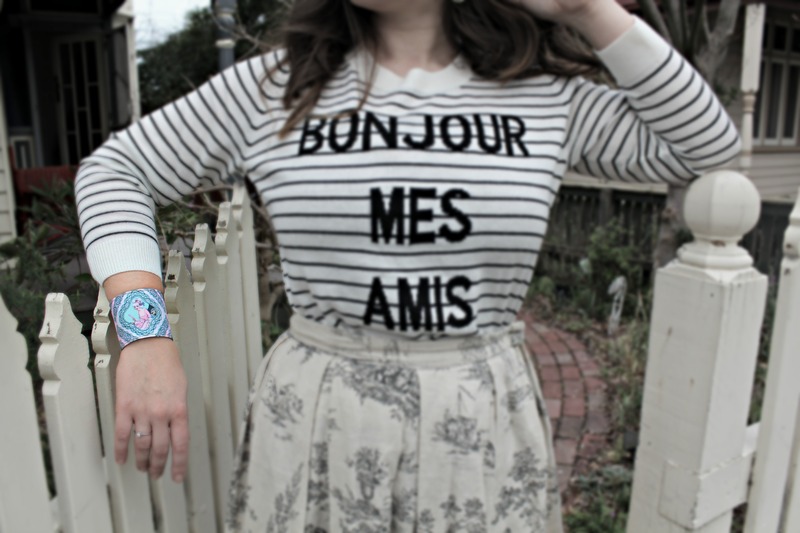 I love the eggshell-blue and blush pink of this Marie Antoinette-style cuff, called Munequera Catalina. Hot Chocolate Design also have a series of matching accessories to match their shoes – such as cuffs, wallets and bags. 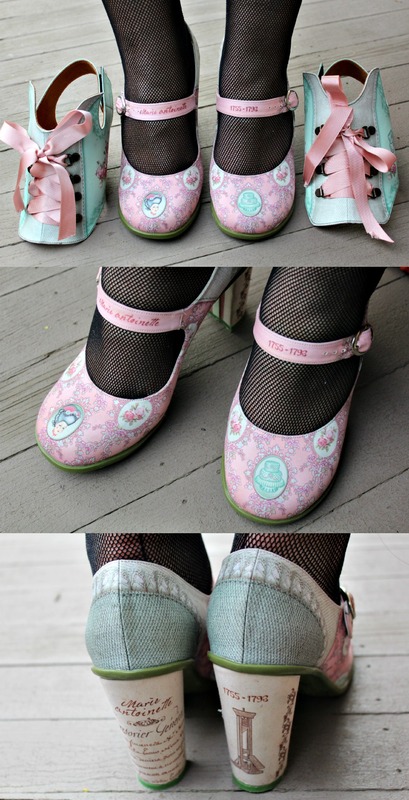 The shoes also come in mini-chocolaticas which are super kawaii shoes for kids. As yet unreleased in Australia (but coming soon and utterly amazing) are the Hot Chocolate Designs Doble Topping selection of high heels which are convertible – they feature a kind of spat-overlay system which makes the shoe more or less decorative depending on your mood. Their exclusive Marie Antoinette shoe illustrates elements of the legend of Marie Antoinette – featuring incredible overlays featuring cameos, ribbons, flowers, cakes (of course! ), Marie Antoinette’s birth and death dates, and even a guillotine. Morbid? Maybe. Creative, unique and head-turning (ahem)? Absolutely. These are the best shoes I own without a doubt. And check out their marketing! How many brands do you know that have a strong enough understanding of their corporate values and their clients’ sense of the unusual to go with this revolutionary advertising campaign? M’encanta! Do you see how the shoes can transform to reveal other elements of their artwork? I’d be inclined to save my be-ribboned Marie Antoinette spats for special occasions, wearing them in their pared-back form for meetings or daytime events instead. 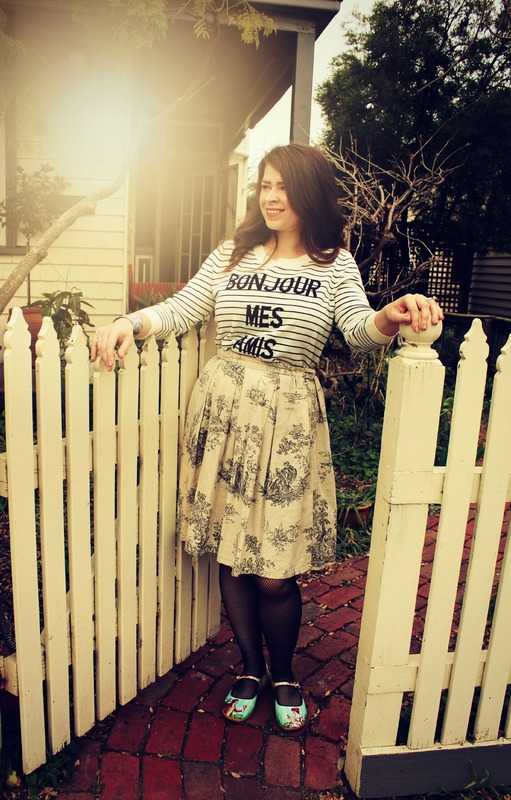 Wearing: Ally Fashion knit, french toile skirt (I made it myself!) 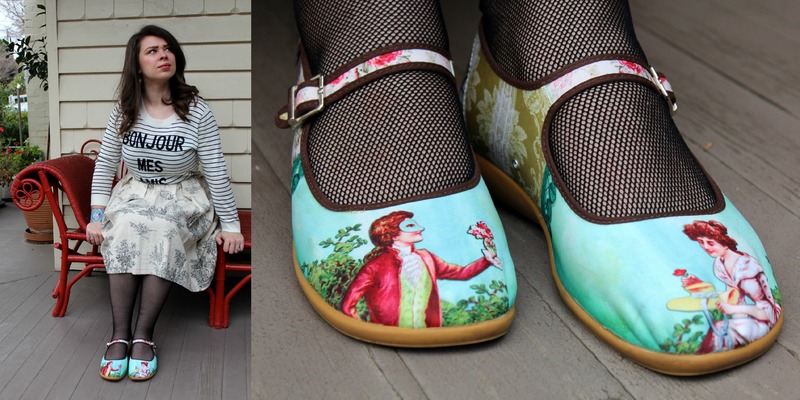 and Hot Chocolate Design Marie Antoinette shoes (will be coming to Australia soon). Explore the Venezuelan Hot Chocolate Design website which offers a taste of what’s to come in deliveries to Australia. 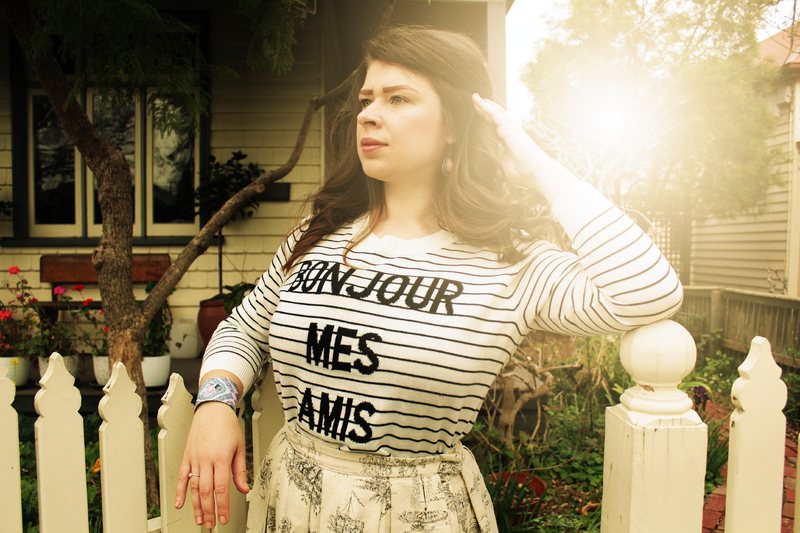 Their Australian online store has many beauties you can nab now – so don’t hold back! We love their fairground flatties – the Carrousel – and can’t wait to see the Doble Topping heels called Holly Pop (amazing artwork for this shoe, below). Check in with the Hot Chocolate Designs Australia Facebook page to stay updated with new shoes, and the markets you may find them at. Thank me later!